Nothing too exciting to report yet, but we were able to apply the top ledge piece to the wainscoting last night. It was by far the easiest part we've tackled so far! Everything went according to plan and it only took us about 30 minutes to get it up (that's what she said). Then we lined up our laser line on the saw at the point those lines intersected and cut a perfect 45 degree angle. Then we held that piece in place and scored the angle for the other side (we knew this would not be a perfect 45-45 corner). It worked pretty well! Since our walls aren't perfect squares, there was a small space in between the 2 pieces, but nothing I wasn't expecting or that a bit of wood filler and sanding wouldn't resolve. I took some pictures of my corner, but they were blurry so look for those in an upcoming post. 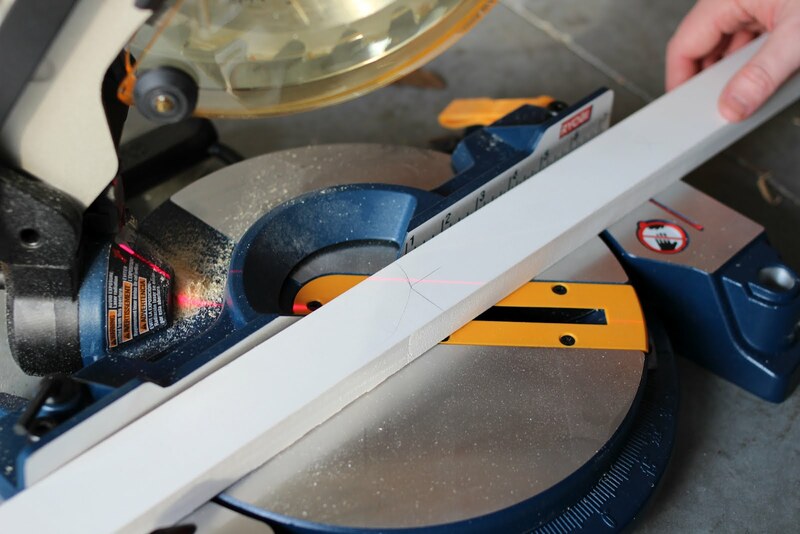 After we got that corner situated, we cut any remaining pieces and attached them. 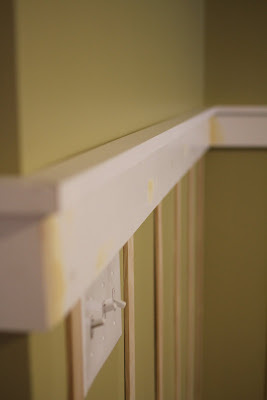 We used construction adhesive all along the top of the top rail, then placed the ledge pieces on top and used the brad nailer to secure to the top rails. 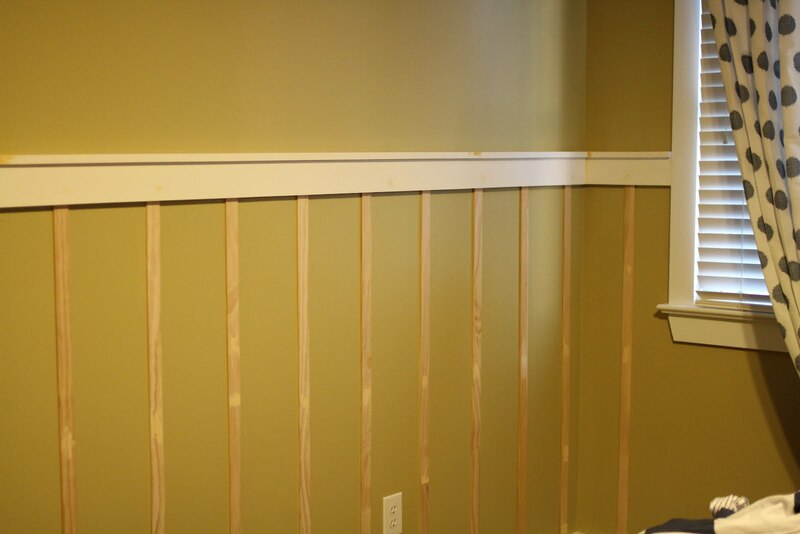 Originally, we felt like we'd have to use the finishing nails and toenail them into a stud, but after thinking about it and researching online, we decided that the brad nailer and adhesive would be fine. After all, this top piece is just decorative and not heavy. The adhesive should hold it up there! You can see in this photo that there is a small space between the wall and the trim piece. These are both just facts of life when you're dealing with imperfect walls and imperfect trim. Again, caulk will come to the rescue soon enough! 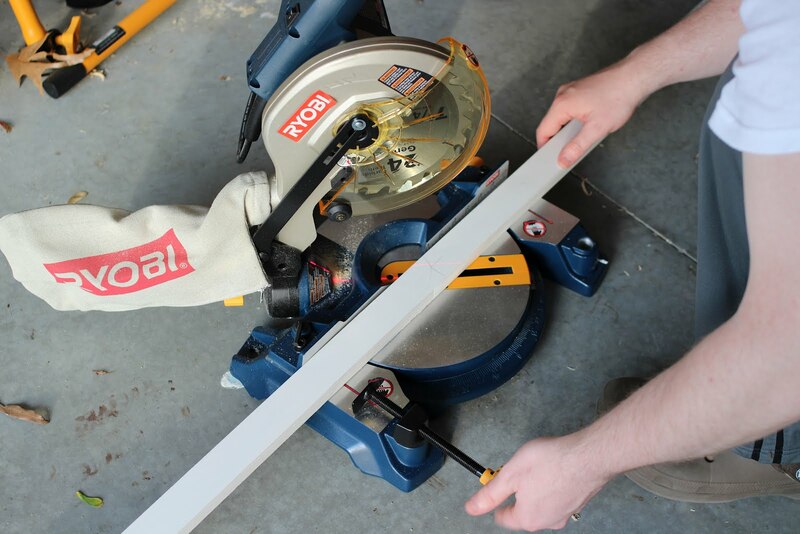 BTW, here's a shot of the saw we got: Nothing fancy, but it's working perfectly for this job. It probably won't cut anything wider than 4 inches, but at $90, we thought it a bargain to be able to do all our own cutting!